Babos enjoyed a big win on Friday, taking out last week’s Indian Wells semi-finalist, Karolina Pliskova, 5-7 6-2 7-6(0). Babos failed on three occasions to wrap up the match, unable to serve it out at *5-2, *5-4 and *6-5. However, in a rather strange twist, Babos then scored a tiebreak bagel to record her first ever win over Pliskova in four matches. 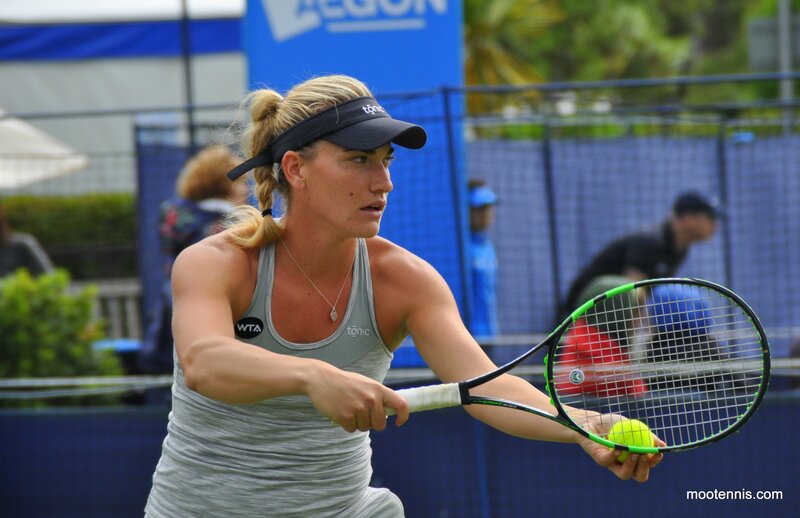 Babos has had an encouraging year up till now, reaching the semi-finals of Shenzhen, the quarter-finals of St. Petersburg and the third round in Doha. Her year stalled somewhat in the last two tournaments with first round losses in Monterrey (to Polona Hercog, 3-6 2-6) and Indian Wells (to Lesia Tsurenko, 5-7 4-6). Furthermore, she’s had a few situations where she has been in a winning position but failed to take her opportunities. In St. Petersburg, Babos served for the match in the quarter-finals against Vinci but lost out in a third set tiebreak. This highlights the magnitude of the win over Pliskova. Osaka is in the midsts of what appears to be a breakthrough year on the WTA tour; the Japanese player has already risen nearly 100 places since the end of 2015 and is knocking on the door of the world’s top 100. Osaka is at 16 match wins in 2016, which includes successfully qualifying for the main draws in Brisbane, Hobart and Melbourne. Osaka edged a tight three setter in her first round match against Pauline Parmentier, 6-2 2-6 6-2. On Friday, she produced a stunning display to take out the number 14 seed, Sara Errani, 6-1 6-3. Osaka was electric on serve in the first set, not dropping a point behind it. Osaka is sound off both wings but that forehand is SPECIAL. The 18-year-old lost her early break in the second set as Errani, playing more aggressively and mixing in drop shots and angles too, mounted a mini-comeback. However, Osaka refocused to win the final two games and close out the match on yet another forehand winner. Naomi Osaka absolutely rollllling over Sara Errani. 6-1 in just over 24 minutes. Lost only 12 points, none on serve. Head-to-head record: This will be the first time that Babos and Osaka have played each other on the WTA tour. Interesting stat: Both players will be seeking to reach the last 16 of a WTA Premier Mandatory tournament for the first time in their career. March 26, 2016 in Babos, Miami, Osaka, WTA. Sorry Dan, you plagiarized MooTennis articles to your site. This is not right man! It’s OK, Frank. I know Dan from Twitter and he’s just sharing the posts to his readers. *Shakes head* Lucie Safarova gets knocked out so Petra decides to leave too… silly Petra. and humidity. Aga Radwanska said after her match today that once she’d won, all she could think about was getting in the ice bath. I think Osaka can withstand the heat better than Babos if the heat is the real deal. I think it will be a very close battle between Babos and Osaka. The only concern for me to pick Osaka is that she is not good at the net in which Babos may exploit this area to counter attack her. I really like Osaka’s games. Hopeully, Osaka in 3.